A racing drone steps up against the Mercedes-AMG GT Roadster in the ultimate air-land duel at the Circuito Estoril, in Portugal. Who would you bet on? The AMG convertible or the… identified flying object? The racing drone is usually used for drag races and it comes with wow specifications: it hits 100 km/h in under one second. It was specifically built to be faster than a race car. Its top speed stops though at 180 km/h. The drone weighs little over half a kilogram (535 grams). The Mercedes-AMG GT R Roadster can hit 302 km/h and runs from a standstill to 100 km/h in 3.9 seconds, all thanks to its 4.0-liter biturbo V8 of 476 horsepower and 630 Newton meters of torque. Niki drives the car, while Mitch “drives” the drone along the 100-meter strip. Well, it’s easy to guess who wins that one. The second race takes them to a 200-meter strip. Things don’t change much here either. The 300-meter distance coming up next and Mitch is starting to worry. 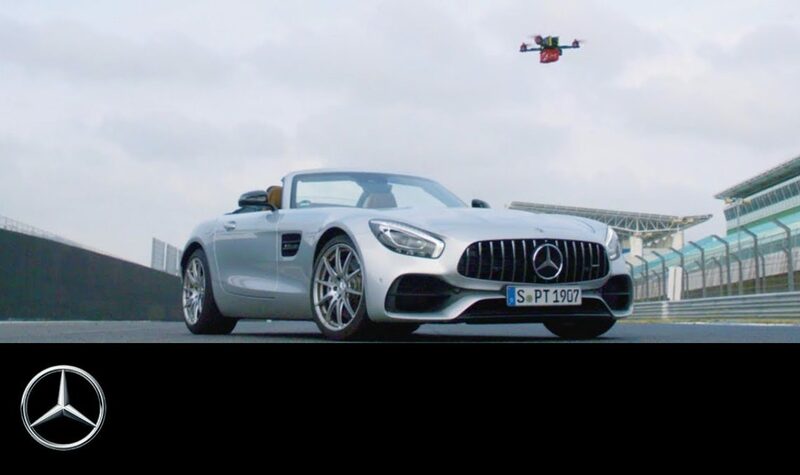 The distance would give the Mercedes-AMG GT Roadster enough time to exceed the top speed of the drone. Will he win again or will the Roadster get its way on the racetrack? “It was a fantastic battle against this unbelievable race machine”, Niki says, when the duel comes to an end.